Hong Kong, Hong Kong, December 2, 2016 (Newswire.com) – NaviPack is proud to announce the release of a groundbreaking product for autonomous control of drones, robots, and other devices. The low cost, ease of use, and pure utility of the NaviPack LiDAR navigation module makes integrating control for vehicles and robots easier and cheaper than ever before. What makes NaviPack different from other LiDAR systems begins with the built-in SLAM algorithm chip. By integrating the control chip and LiDAR together, NaviPack becomes the first true plug-and-play LiDAR solution that instantly powers drones and robots with 360 degree sensing capabilities. NaviPack is also much easier to use than other similar systems on the market. Once installed and powered up, it immediately scans its surroundings, builds a detailed map of the area and takes over control of the device. Its scanner has a frequency of 3000 points per second and identifies objects up to 15 meters away. It continuously scans the area and makes split second decisions to steer clear of people or objects for safe path selection, obstacle avoidance, and accurate mapping. Having an all-in-one navigation unit such as NaviPack will pay great dividends to engineers and makers and promises to reduce integration times for navigation systems by up to 6 months, something that cash-strapped startups, student engineers, and hobbyist will appreciate. NaviPack has wide compatibility with Windows, Linux, Android and ROS systems and utilizes a variety of connection protocols including Serial, USB or Wi-Fi for fast and simple operation and programming. NaviPack makes using the module easy with inclusion of many useful APIs. It is truly simple to install and use across a wide variety of devices and applications. For more advanced uses and the option to build a working robotic device immediately, NaviKit is also being offered which includes the powerful NaviCamera, a 3D TOF in-depth camera and NaviPanel which is a wheeled robot platform with five ultrasonic sensors and four geodetic sensors. It can carry loads up to 30kg and makes a perfect platform for developers and hobbyists. The NaviPack system is currently being introduced with special pricing and incentives on Indiegogo to reward early supporters. 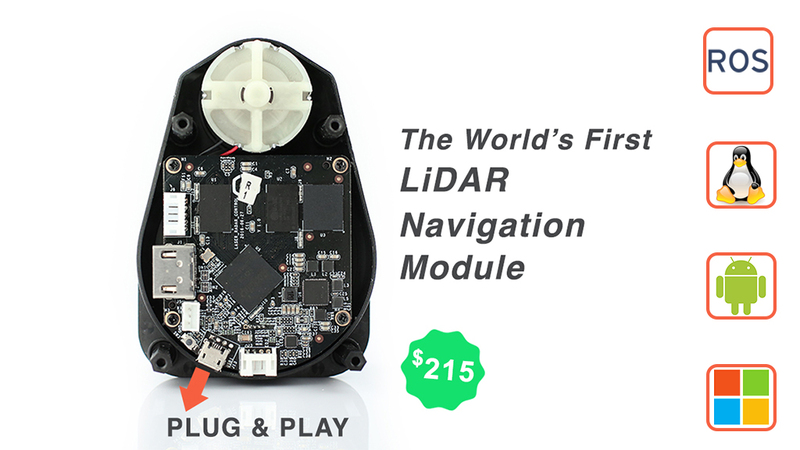 2 Responses to "LiDAR Navigation Module for Drones, Robots and Autonomous Devices"
Most UAVs can only carry a light payloda so small, light and also affordable LiDar sensors are great news for drone sector.